Email marketing is still the best way to get value from your marketing budget – that is why it should be continuously developed! A clear trend during the past years has been making email marketing more efficient by segmenting and targeting messages. When just the right content is offered for the right people, the ROI of newsletters can be notably improved. How does one get started in email marketing segmentation, and what does one need to know? What different target groups can you utilize in your email marketing? Most companies have varied stakeholders and marketing and communications target groups that benefit from targeted communications. It pays off to start segmenting by defining your own stakeholders and target groups, and then choosing the ones that might benefit from targeted email marketing the most. You can't and shouldn't try to reach everyone, and the time spent and other resources used must be compensated financially. What are the communication objectives? How often does communication happen? What are the contents of the message? What are the text and imagery like, and are videos being used? Who are part of the group and how are members added to this list: is it an opt-in list that a customer can join on a website, or is the list joined through CRM markings or by participating in an event? Who communicates – are newsletters composed by the marketing and communications team or are they also sent out by the sales or HR department? How can it be measured whether objectives are being met or not? Is it desired that the messages are sent manually or is automation welcomed in email marketing for some parts? When it is clear what is being communicated, it's time to take a look at the technology: how is targeted email marketing done in practice. A separate, customized template for email marketing is handy for different target groups or for different uses. It is easy to move between the different templates in most email marketing tools and different templates also gather up their own statistics. Image: Liana Technologies uses different templates for their different target groups. Where can the data be found that is needed to create different target groups? Does it already exist in the email marketing system and can new target groups be created by organizing existing information, or should new lists with new information be imported? Or is the needed data perhaps in the CRM or some other system that can be connected straight to the email marketing system? Or is the objective to create segments that combine many different systems and are being imported straight from the marketing automation system? The simplest way is to create a form with different fields on the newsletter subscription page that help the customers to naturally divide into groups according to their interests or areas already when they subscribe to the newsletter. A very simple method for segmentation is to create different lists or folders in the email marketing tool and send varied content to different lists manually. With dynamic lists it is easy and fast to gather the people that fit certain criteria on the same list: do the definitions once (for example nursing students in Berlin and Hamburg), and the lists update automatically always when new data enters the system. Personalized blocks are a fast and effective way to do targeted email marketing. You can create alternative content in just one single newsletter that shows up differently for recipients that fit certain criteria. This is how a person interested in “family offers” sees a family spa offer and a person interested in “couple's offers” sees pampering spa offers for adults. 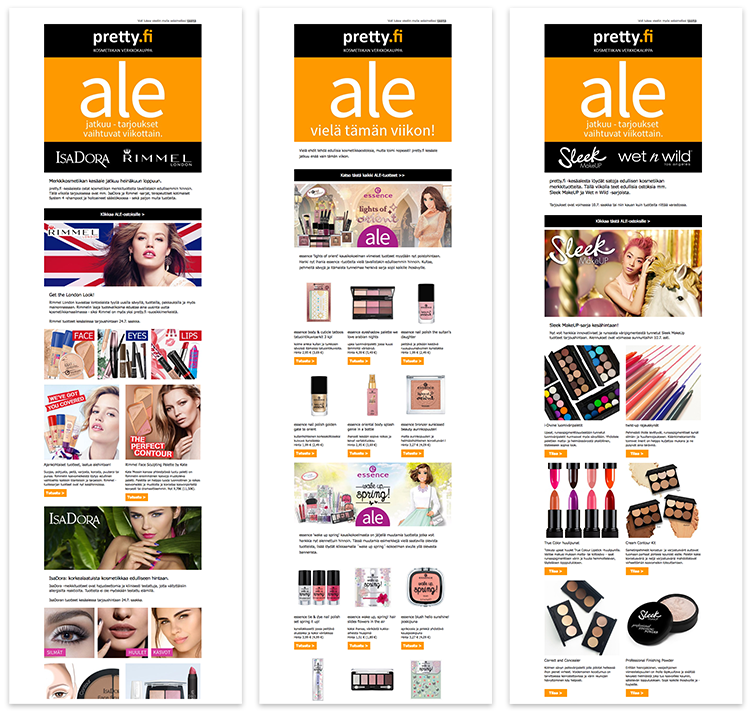 Image: Pretty's newsletter looks different for recipients in different target groups. This is done with personalized content blocks. Customers that haven't bought anything in a while. Customers that have just bought a certain product. Potential customers that have shown interest towards a certain product in a webstore or on a website but haven't bought it yet. People that have been to a company event within a certain period of time. Customers that have/haven't logged on their account within a certain period of time. The list is endless – basically all the data that a company has about their customers can be used in marketing automation and can be segmented as target groups for email marketing. 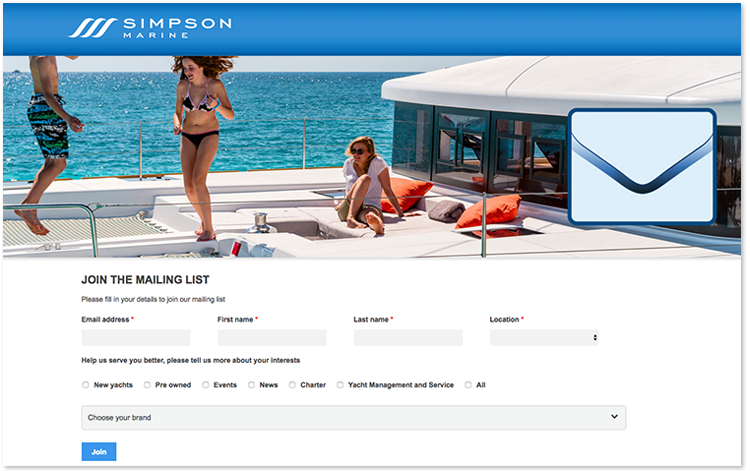 Image: The subscription form for Simpson Marine's newsletter inquires about the subscriber's interests. If new email marketing target groups bring new users, remember to order a training for them as well from your email marketing tool provider. An internal training is rarely as thorough as an “official” version, and working hours are spent fumbling around. Something in addition to email marketing? With new target groups, you can send messages through the same systems in different ways as well: many email marketing systems also enable SMS messages and when an automation system is combined to the email marketing tool, the possibilities are endless from social media campaigns to push notifications on mobile apps. Are you interested in making your email marketing more efficient? Invite us over, and let's make a plan for your marketing needs together!